In the ideal world we’d like our customers to come back to us again and again… after all, customers are the lifeblood of any business. No customers = no business! But don’t customers come back anyway? 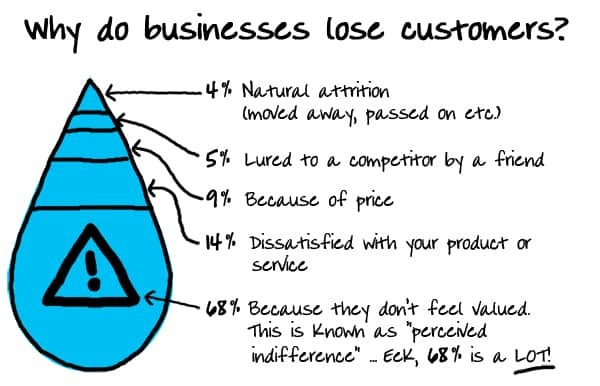 Customer retention campaigns are vital, so that you don’t lose 68% of clients through ‘perceived indifference’. We have to put time, effort and resources into ensuring our customers come back, and that’s why customer retention campaigns are so important. Is it really worth putting in this effort into repeat business? Yes, absolutely! It’s 6 or 7 times more expensive to find a new customer than it is to retain an existing customer. So if you need to be careful about your marketing expenditure (and which small business doesn’t! ), then it makes sense to focus on your customer retention campaigns. Not only can it mean more repeat business, but also more referrals. If you’re regularly contacting your best customers in a helpful, proactive way, chances are they’ll be impressed by your care and attention. They’ll feel valued and appreciated… and that means that they’re likely to tell all their friends about your business too. This can transform many customers into being Advocates or Raving Fans, who’ll do your marketing for you. The key to customer retention is to get clients to climb the magic beanstalk of customer loyalty. Notice the topics of customer retention and customer loyalty are very much related. Why? Because it takes a happy, satisfied customer to become an advocate or raving fan. Most of these levels are fairly self-explanatory. 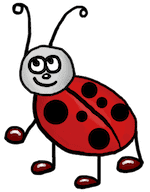 The one thing that does tend to surprise business owners is the ‘Shopper’. That is, that someone who’s bought from you once is not a customer – they are just trying you out. Is your product/service of an adequate standard? Is your product/service priced at a level to match its quality? How good and consistent is your customer service? Are you regularly maintaining contact with your clients? Not just to sell them more, but in a way that adds value and makes them feel appreciated? Assuming that you’re happy with your answers to those questions, you can now focus on how to get your clients to climb that magic beanstalk of loyalty. Although you might get some raving fans without trying, most clients need a little more encouragement to climb this magic beanstalk of customer loyalty. They need a reason to climb it, and it’s your job to give them those reasons. Even if you do all the right things, not all clients will climb the magic beanstalk of loyalty. It’s impossible to convince everyone to be a raving fan. For some people, it’s simply not part of their personality to gush and enthuse about other businesses. Or for others, maybe the fact that they use your product or service is their little secret that’s very personal to them. It doesn’t mean they don’t love what you do, it’s just that they want to keep it to themselves. And that’s okay: they’ll appreciate that you’re keeping in touch with them anyway, and will help to ensure that they’ll remain a loyal customer. They may climb the magic beanstalk of loyalty as far as ‘Member’ level, and that’s fine too. Besides, so what if a certain percentage of clients don’t climb the magic beanstalk of loyalty all the way to the top? That’s okay too, because many others will – provided you give them a reason to climb. The good news is that you have lots of tools and media to encourage your clients to climb the magic beanstalk of customer loyalty. And many of these are low cost, too. Over the coming weeks, I’ll be writing about each of these five media, so you can see how to use these tools, their pluses, and their negative aspects. These media vary in terms of effectiveness, and you need to be aware of this. I’ve seen far too many business owners use just one tool (or maybe two tools), and think that’s enough. For your message to really get through, you need to be using as many of these media as you can, and as effectively as you can. People are incredibly busy these days, and if you use just one medium, your business will appear flat and one-dimensional. The more media you use, the more multi-dimensional and sparkling your business will appear! For your customer retention campaigns to work, you need to implement them all year round. After all, you can’t water magic beans just once or twice a year and expect them to grow: you need to water them regularly. Same with your marketing campaigns; you need to tend to them regularly. That’s why it’s vital that you make a marketing plan for the year, which includes regular customer retention campaigns. And then diarise these campaigns to make sure they actually happen. 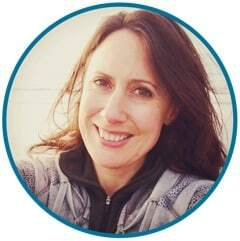 Face-to-face: arrange a catch-up with your top clients every quarter or every six months. We’ll cover each of these media in more detail over the coming weeks, but that gives you an overview of how you can use multiple media without getting overwhelmed. To get repeat business, you need to actively work on your customer retention campaigns, so that clients feel valued. It’s 6 or 7 times more expensive to find a new customer than it is to retain an existing customer. Customer retention is strongly linked to customer loyalty. 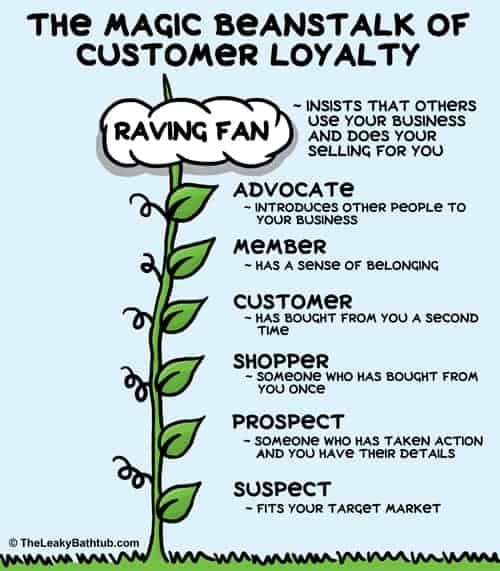 There are various different levels of customer loyalty; your job is to give clients a reason to climb the magic beanstalk of customer loyalty. You need to have a year-round plan to make sure you’re continually at front-of mind with your clients.